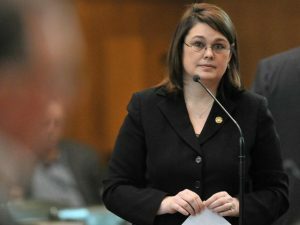 About a year ago, Oregon State Senator Sara Gelser came forward with allegations of sexual harassment against former State Senator, Jeff Kruse, eventually leading to his resignation. Gelser was recognized as one of TIME magazine’s 2017 “Silence Breakers”, a story about people who spoke out against similar behavior. The Advocate sat down with Senator Gelser and spoke about her allegations against Kruse, cultures of harassment in the workplace, including the legislature, and the difficulties still faced by those who choose to speak up. Earlier this year, an independent investigation found that former Senator Kruse engaged in “a longstanding pattern of…unwelcome physical contact toward females in the workplace…and that he stubbornly refused to change that behavior after being warned about it in March 2016.” Kruse denies his behavior was wrong, but in many cases doesn’t deny specific accusations, insisting he is “just a hugger.” He was allowed to remain in the Capitol, alongside people he allegedly harassed, until a resignation date which he negotiated. Asked about laws protecting women in the workplace, Gelser pointed out the issue of harassment isn’t so narrow. Gelser does have plans to deal with the specific problems -— she intends to introduce a bill in the coming session dealing with the timeframe for investigations of harassment claims. She is also proposing a constitutional amendment to give any public employers with elected officials the power to place those officials on administrative leave if their presence would create a hostile work environment. She agreed with Speaker Tina Kotek and others who have said they want more tools for the legislature to hold its members accountable, but thinks the core of the problem is the culture which burdens accusers and survivors with moving this process forward. Outgoing Labor Commissioner Brad Avakian recently filed an aggressive complaint against the Oregon Legislature, accusing them of fostering a hostile work environment. We asked Senator Gelser what she thinks of the process, and whether she believes it is an effective tactic to deal with the issue. Harassment and speaking out have also taken center stage in national politics this year. The nomination hearings for now-Justice Brett Kavanaugh put the issue of believing survivors front and center.